: The LM1117-N IC is a series of low dropout voltage regulators with a dropout of 1.2V at 800mA of load current. 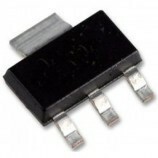 Available in 1.8V, 2.5V, 2.85V, 3.3V, 5V, and Adjustable Versions. Space Saving SOT-223 and WSON Packages. Current Limiting and Thermal Protection. o LM1117-N: 0°C to 125°C. o LM1117I: −40°C to 125°C. Electrical/electronic mini and major projects.